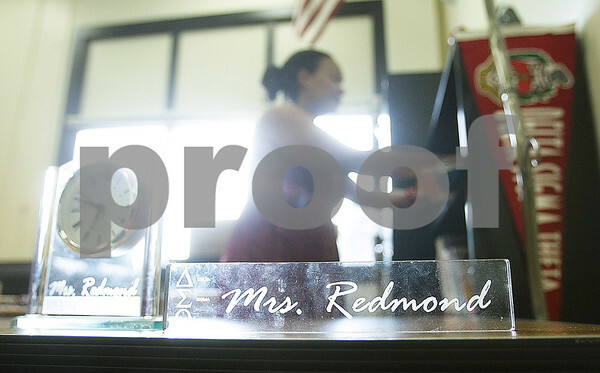 A Northern Illinois University and Delta Sigma Theta alumna, Clinton Rosette Middle School eighth grade language arts teacher Treveda Redmond sets up her classroom for this school year on Wednesday, August 6, 2014. Redmond will start her first full year teaching after receiving a breast cancer diagnosis last October. Although an aggressive treatment for a stage zero diagnosis, Redmond opted for a double mastectomy and reconstruction because she didn't want to be constantly worried about cancer.